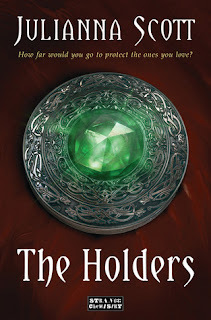 As soon as I heard about The Holders by Julianna Scott, I became very excited to read it. I love the idea of Ireland as a setting, with the folklore and history that comes with that. And I especially love the idea of a story that deals with people who have special powers. I'll admit, I'm a sucker for an X-Men type storyline! 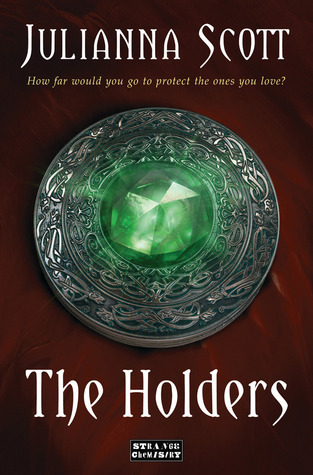 The Holders also has some secrets, a romance and some father-daughter issues and I was expecting to love it beyond words. At the start of The Holders, we are introduced to teenager, Becca, and her little brother, Ryland. Becca is fiercely protective of Ryland and she refuses to let anyone take him away for testing or heavy medication to limit his ability to hear voices. But these two newcomers claim to be able to help Ryland to use and enhance his abilities rather than squash it in order to become 'normal' like other medical professionals have recommended. And despite a lot of mistrust on Becca's part, she agrees to Ryland flying off to this special school in Ireland on the condition that Becca goes with him. At St. Brigid's, Becca and Ryland became more aware of how special Ryland is and their connection to The Holders, a race of people born with special powers. But together with this change of scenery and all this new and staggering information, Becca is also forced into facing the father who abandoned their family so many years ago and she is also trying to come to terms with where Becca would like her own future and prospects to look like, especially with the growing attraction she feels towards Alex, one of the people who came to track down Ryland. I really liked reading about the Holders and especially Alex's ability. There was plenty of surprising twists that happen concerning the prophecy of Ryland and what he respresents for the Holders. I really liked the relationship that forms between Alex and Becca very much, they're a bit tentative and unsure at the start and I love how miscommunication and assumptions on each other's parts seem to hold them apart. It's a very interesting premise and an exciting start to the series. I can't quite pinpoint any faults with it, other than I didn't fully feel it in parts. Still, I'm very much looking forward to reading more! I haven't either, it's a real selling point for me!